HOBOKEN, N.J. (AP) — A rush-hour commuter train crashed through a barrier at the busy Hoboken station and lurched across the waiting area Thursday morning, killing one person and injuring more than 100 others in a grisly wreck that renewed questions about whether long-delayed automated safety technology could have prevented the tragedy. People pulled chunks of concrete off pinned and bleeding victims, passengers kicked out windows and crawled to safety, and cries and screams could be heard in the wreckage as emergency workers rushed to reach the injured in the tangle of twisted metal and dangling wires just across the Hudson River from New York City. The New Jersey Transit train ran off the end of the track as was pulling in around 8:45 a.m., smashing through a concrete-and-steel bumper. As it ground to a halt in the waiting area, the train apparently knocked out pillars, collapsing a section of the roof. "The train didn't stop. It just didn't stop," said Tom Spina, who was in the terminal and rushed to try to help the victims. Ross Bauer was sitting in the third or fourth car when the train entered the historic 109-year-old station, a bustling hub for commuters heading to New York City. "All of a sudden, there was an abrupt stop and a big jolt that threw people out of their seats. The lights went out, and we heard a loud crashing noise like an explosion" as the roof fell, he said. "I heard panicked screams, and everyone was stunned." The engineer was pulled from the mangled first car and hospitalized, but officials said he had been released by evening. He was cooperating with investigators, Gov. Chris Christie said. A woman standing on the platform — identified as Fabiola Bittar de Kroon, 34, of Hoboken, a former legal worker for the payroll-software company SAP in Brazil — was killed by debris, and 108 others were injured, mostly on the train, Christie said. Seventy-four of them were hospitalized, some with serious injuries that included broken bones. "The train came in at much too high rate of speed, and the question is: 'Why is that?'" Christie said. New York Gov. Andrew Cuomo said investigators will determine whether the explanation was equipment failure, an incapacitated engineer or something else. The National Transportation Safety Board planned to pull one of the black-box event recorders Thursday evening from the locomotive at the back of the train. The device contains information on the train's speed and braking. But it wasn't safe enough yet for investigators to extract the second recorder from the engineer's compartment because of the collapsed roof and the possibility of asbestos in the old building, NTSB Vice Chairwoman Bella Dinh-Zarr said. Investigators will examine the engineer's performance and the condition of the train, track and signals, among other things, she said. They also plan to look into whether positive train control — a system designed to prevent accidents by overriding the engineer and automatically slowing or stopping trains that are going too fast — could have helped. None of NJ Transit's trains is fully equipped with positive train control, which relies on radio and GPS signals to monitor trains' position and speed. "While we are just beginning to learn the cause of this crash, it appears that once again an accident was not prevented because the trains our commuters were riding lacked positive train control," said Rep. Sean Patrick Maloney, D-N.Y. "The longer we fail to prioritize investing in rail safety technology, the more innocent lives we put in jeopardy." Both Cuomo and Christie said that it is too soon to say whether such technology would have made a difference. Even without positive train control, there are still safeguards in place at the Hoboken terminal. NJ Transit trains going into Hoboken have an in-cab system that is designed to alert engineers and stop locomotives when they go over 20 mph, according to an NJ Transit engineer who spoke on condition of anonymity because he was not authorized to discuss the accident. Trains like the one in Thursday's crash are also equipped with an alerter system — a sort of dead man's device — that sounds a loud alarm and eventually stops the train if the engineer goes 15 to 20 seconds without touching the controls. But it was not clear whether those mechanisms kicked in or would have made a difference if they had. The train was not equipped with an inward-facing camera in the cab that could give a fuller picture of the operator's actions, though Dinh-Zarr said it did have outward-facing cameras on both ends. The Hoboken terminal handles more than 50,000 train and bus riders daily, many of them headed into New York City. After arriving at Hoboken, they take ferries or PATH commuter trains across the river to the city. Passengers said the train, which set out from Spring Valley, New York, was crowded, with standing room only in the typically popular first few cars, but authorities had no immediate estimate of how many were aboard. Jamie Weatherhead-Saul was standing at a door between the first and second cars. She said the crash hurled passengers against her, and one woman got her leg caught between the doors before fellow riders managed to pull her up. William Blaine, an engineer for a company that runs freight trains, said he saw the train's engineer slumped over the controls after the crash. More than 100,000 people use NJ Transit trains to commute from New Jersey into New York City every day. With the Hoboken station still closed as of Thursday evening, NJ Transit trains out of Penn Station in Manhattan were crowded with commuters forced to find a detour around Hoboken. "My 30-minute commute is turning into at least an hour and a half," said Steve Malfitano, who had to go into New York just to get from one New Jersey city to another. But he added: "It is what it is. It's better than what those people had to go through." 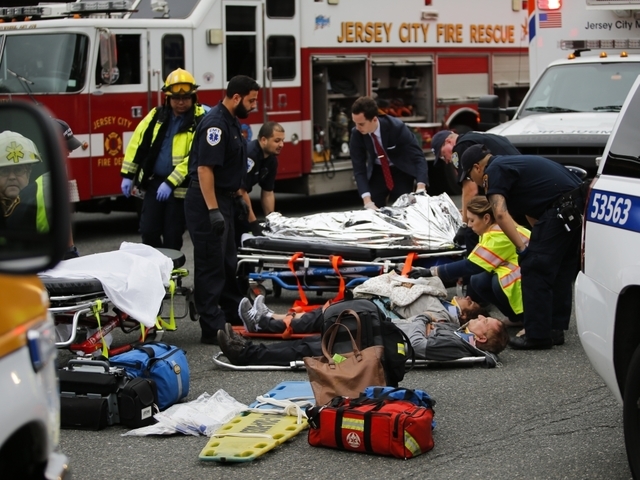 In 2011, a PATH commuter train crash at the Hoboken station injured more than 30 people. The train slammed into bumpers at the end of the tracks on a Sunday morning.